TORONTO, Sept. 20, 2016 /CNW/ - Wow Canada, you really love Lay's Chalet Sauce potato chips! Since its launch on September 5th, Canadians from coast-to-coast have been buzzing about this unique Canadian delicacy and clamoring to get their hands on a bag. If you missed out, don't worry, more is on the way! 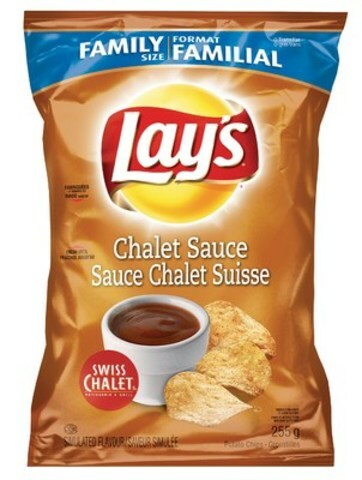 New shipments of Lay's Chalet Sauce potato chips will be arriving at Swiss Chalet restaurants nationally throughout the month of September, with limited quantities available. What's more, plans are underway to expand this wildly-successful release to retail on November 1st. "We knew Canadians would have a sweet spot for Lay's Chalet Sauce chips, but the response has been beyond our expectations," says Shereen Yasseen, Senior Director of Marketing – Frito Lay, PepsiCo Foods Canada. "We're ramping up production as quickly as possible to get more bags into Swiss Chalet restaurants nationally in advance of our November 1st retail launch. " Swiss Chalet's secret recipe sauce has been a staple with Canadian families since 1954, developing a cult following among Canadians. The launch of Lay's Chalet Sauce chips have proven Canadians' love for the restaurant's famous flavour. "Canadians have flocked to restaurants across the country for the 'most Canadian chip' ever and this overwhelmingly positive response has resulted in many locations selling out within days of launch," says Lindsay Robinson, Director of Marketing – Swiss Chalet, Cara Operations Limited. "We are beyond excited about our guests' love for the Lay's Chalet Sauce chips and our goal is to restock our restaurants as quickly as possible so that fans can satisfy their craving once again!" Canadian Chalet sauce lovers the countdown is on! Beginning November 1, Lay's Chalet Sauce potato chips will be available at mass retailers and grocery stores across the country in 255g, 66g and 40g bags. Quantities will be limited so get yours while they last!